Parked by the edge of a beautiful loch, we were all set for our barbecue in the Scottish Highlands. The warm scent of the strongly burning charcoal, pretty rolling hills and the rhythmic sound of flowing water resonant from a stream below; it was perfect. It was freezing but it did not matter an iota for we were wrapped in happiness thick. An unshakable reverie, a priceless moment, a memory that we would cherish for the rest of our lives. Our summer holiday was here and we had just landed at Heathrow. Once the airplane docked, the indefatigable duo-our kids charged through gates. My wife and I were exhausted and we wanted to get to our hotel and crash, but our little masters had other plans. Never has there been a truer equation than the inverse proportionality of your child’s excitement level to your fatigue; perils of the job I guess. But it’s a job you’d love to hate. 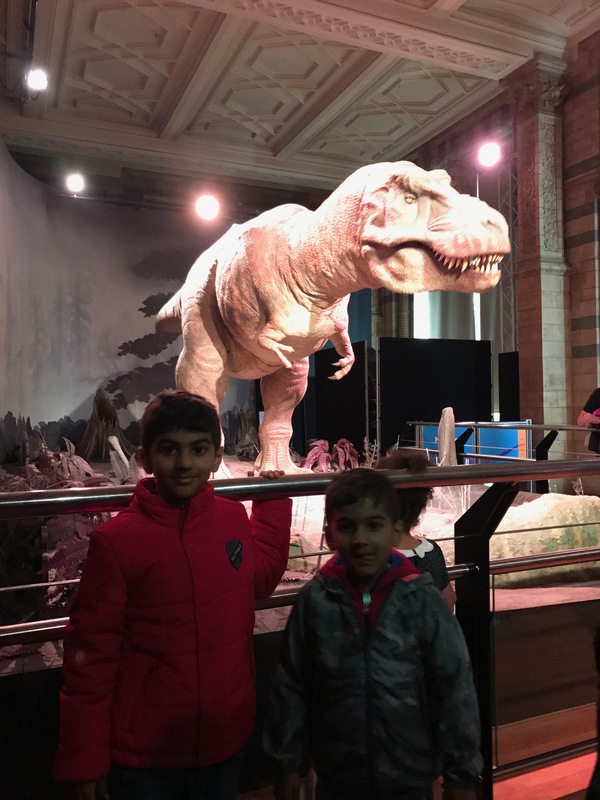 Soon, the amusement levels had significantly dropped and we had to rush to the T-REX exhibit at the museum to calm things down, now that’s an irony at its best! We explored the many exhibits at the museum. Blending informational content to pique your child’s interest while on a family vacation is always a winner. It was lunchtime by the time we were done and after exiting the museum, we made our way to the restaurants at the nearby Queen’s gate gardens. After lunch, we took the tube to Piccadilly Circus. It had started to rain but that was not going to dampen out spirits, we bought some rain gear from one of the kiosks, grabbed a cappuccino and we were off to the freaky Ripley’s believe it or not. After Ripley’s we walked down to the lively Leicester square.We spent the rest of the evening there, the square with is eclectic character and spirit is our personal favourite in all of London. The sun sets really late in this part of the world giving us a lot of time at the square. The kids loved running through the fountains. It was overcast today, the accuweather app however suggested that no showers were predicted for the rest of the day. London weather is really unpredictable, but the app does give you a pointer and we were on our way to the London eye. We took a tube to Waterloo underground station and at a 10 minute walk from the station, sits the London eye. We had bought skip the queue tickets from its official page and this saved us a lot of time. There are promotions if you buy from their official page and also great deals at Groupon.com. The views of the city, the Shard, Big Ben, Houses of Parliament and the Tower Bridge are simply breathtaking! After visiting the London eye we grabbed a quick bite at the Waterloo station and made our way to Oxford Street. The first stop at Oxford Street was at the Disney store – no surprises there. We strolled through the bustling Oxford Street and were there for the remainder of the evening. At a stone’s throw from Oxford street, is the vibrant borough of Soho. Its electric demeanour offers round the clock entertainment and a cluster of restaurants offer the most diverse and authentic cuisines. We treated ourselves to the best dimsums in town. Soho also houses the best Michelin star restaurants in all of London. Today, we were on our way to the Diana Princess of Wales’ Memorial Playground. Took the tube to Queensway station and at the corner of the Kensington gardens is a kid’s paradise. This playground for kids was built to commemorate the late Princess. A huge pirate ship, surrounded with beach sand sits in the centre of the playground with lush green trees all around. Looks like it jumped right out of a Peter Pan’s tale. After the gardens, we went to Oxford Street and dined at Wahaca, a super Mexican restaurant. Aping his parents, our older one was ecstatic to have his first babycino, as the younger one intently watched him; runs in the family I guess. We walked to the Trafalgar square and spent the evening there. In the evening we took the tube from Trafalgar to chalk farm and visited Primrose hill. There is an easily climbable hill at the Primrose park and the views of the city from the hill are spectacular. It is a very quaint and peaceful place to view sunsets and is extremely popular with the locals. Late evening, we went to the nearby Camden town. Camden has a thriving nightlife, dozens of pubs, jazz cafes, live music and tons of restaurants. Today was a leisurely family day at Camden town. By the famed Camden locks, is the Camden market that dons many shopping kiosks, cafes, live music, tons of multi-cuisine over the counter restaurants. There are boat trips at the canals there as well with one of stops being the Lords cricket ground. In the evening, we visited the M&M’s, Nickelodeon and the Lego stores store at Leicester Square. The lego store here is immensely popular and people queing up to enter . As parents, one of the most daunting tasks is to make your child agree to wait in a line to enter a toy store. We loved the way the folks from the store worked this out and kept the little ones entertained. They did these gigs with toy Lego phones. A make believe phone call to the grandparents back home from the lego phone models did the trick and suddenly the children were ok to wait for their turn to get in the store. It was a bright sunny day today, perfect for the hop-on hop-off bus tour. We took the tube to Trafalgar Square and took the hop on hop off bus to the tower bridge. We visited the top tier of the bridge with the glass bottoms. It was kind of freaky at first but the kids really loved it. Our tour included a visit to the exhibits showcasing mechanics of bascule and suspension bridges, pretty fascinating and extremely informative for the kids. Spent some time at the park adjoining the tower bridge and walked across the bridge to take a ferry ride. A part of the hop-on bus package, it is an enjoyable short ferry service on the Thames. It connects St.Katharine Pier to the London Bridge tower pier and provides magnificent views of the city. After disembarking we continued our journey on the bus through the boroughs. It covers almost everything and it was a great way to see the city. We got of at Trafalgar Square and walked to Leicester square for our last evening there.